PlantVisor Enhanced is monitoring and telemaintenance software for refrigeration and air-conditioning systems controlled by CAREL instruments. PlantVisor Enhanced is available in the Local version (with the PC-Gate converter included) for computers connected to the instruments, and in the Remote version for the centralised management of alarms. PlantVisor, thanks to the embedded Web Server, can be used on a series of PCs connected to a TCP/IP network. In this way, the information can be shared by a number of users at the same time. Access to the data is protected by different levels of password. 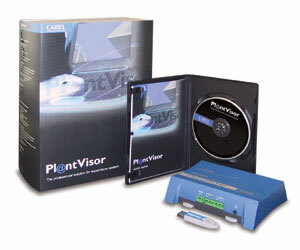 Up to 200 CAREL instruments can be connected to an RS485 serial network using PlantVisor. � adoption of Retrofit Solutions using new acquisition modules. PlantVisor Enhanced Local manages traditional and GSM modems to send faxes, SMS messages and for remote access with PlantVisor Remote or Microsoft� Internet Explorer. PlantVisor Enhanced Remote can communicate with: PlantVisor Enhanced Local; PlantWatch; pCO sistema controllers with modem boards; Gateways. It can also download the data from PlantWatch and interact with the instruments it is connected to.